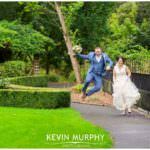 Mary and David were married in the Holy Trinity Abbey in Adare and held their reception just up the road in the Dunraven Arms Hotel. Mary and her bridesmaids got ready in the Dunraven Arms and Mary and her dad walked to the church together which was lovely. Thankfully the weather was kind to us and the ice cream cart at the reception went down a treat! DJ Philomena on the decks while the girls were getting ready. Mary’s taste in music – she loves great Irish music and bands like The Coronas and Two Door Cinema Club kept popping up on the playlist. The bouquet, which was really autumnal and featured blackberries among some other unusual flowers. Probably some of the cheesiest, tongue-in-cheek, sarcastic bridal party photographs I’ve been asked to do – but it was good fun! Patricia on her violin entertaining the guests during the meal – it was a first for me and it really got everyone bringing out their inner Michael Flatley! Stories of David’s voracious appetite during the speeches – I think ordering a pizza as a starter before his steak dinner pretty much sums it up! The brass band (what a great sound) and Mary and David’s first dance – these guys have moves! Their dogs Izzy and Ronnie – after countless attempts I finally got a photograph of them without them barking at me! A contender for best dressed hair dresser of the year. Everyone’s reaction to seeing Rachel in her dress for the first time. Their wedding car. Johnny’s pride and joy. The little glances and reassuring smiles between Rachel and Mike during the ceremony. The music Rachel and Mike had chosen for their ceremony – which had an uncannily similar to the music I had at my own wedding. Tea and sandwiches in the Green Bar. Paying a surprise visit to Rachel’s granny. Seán giving me a run for my money taking photographs! As with all weddings, the first thing I did that morning is check the weather forecast. Yellow Weather Warning. Again. It’s been one of those “Summers”. It was accurate too – it never stopped raining. All. Day. Long. We made the most of it though. 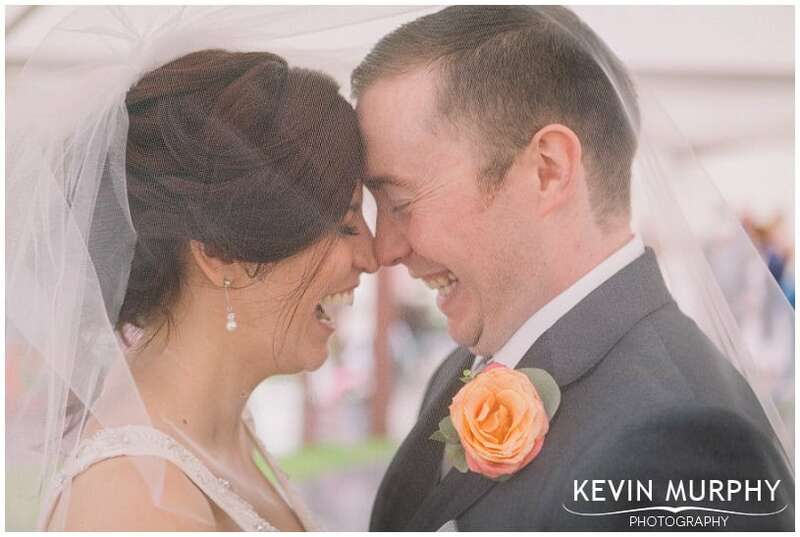 Louise and Mark were married in Hotel Doolin in a humanist ceremony and held their reception in the marquee at the back of the hotel. Apart from a 6 foot dash between the hotel and the marquee nobody needed to go outside which was good. In a way, the rain helped to keep everyone together too – so there was great banter and mingling going on. 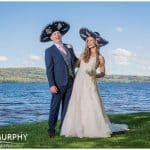 The craic was mighty and the weather didn’t put a damper on the party – in fact it was so good that they managed to blow a fuse during Galway Girl! Big thanks to the locals around Doolin too – all the rain meant there was flash flooding everywhere – which made it almost impossible to get home in the dark. Thankfully the locals had blocked off flooded roads and were actively helping people get home. Phew! The constant surprises. Everyone was in cahoots about something or other – I was afraid to open my mouth! Robbie, who travelled all the way from Australia in secret, a surprise gift for Mark, a secret gift delivery for Louise, an unknown but meaningful exchange during the ceremony, it definitely kept me on my toes. The play lists – every part of the day had a different play list. And the selection was quality stuff- it was like listening to my own iPod. Mark’s quick thinking during a candle lighting malfunction! A flutterfetti exit (I’m still finding bits of it). The festival atmosphere – helped in no small part by the lovely set-up at Hotel Doolin but also by the relaxed, festive mood of the guests. The travel theme which was incorporated in everything from the music to the cake, the table plan to the tables themselves. Mark’s recounting of how they met – from the illegal international apple smuggling through to hitching a ride to Auckland that took 7 days to meet Louise again. Eanna’s email from Louise with speech guidelines. 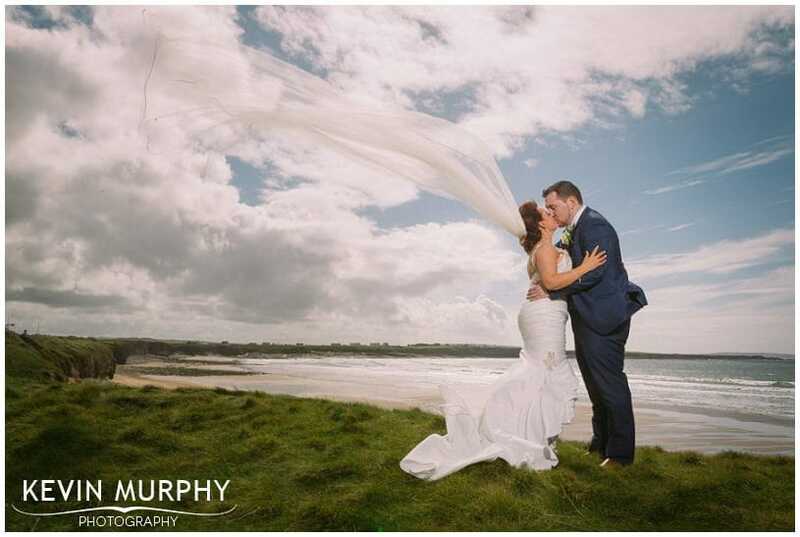 Laura and Henry were married in Doolin church and held their reception in a marquee overlooking the rugged Doolin coastline. 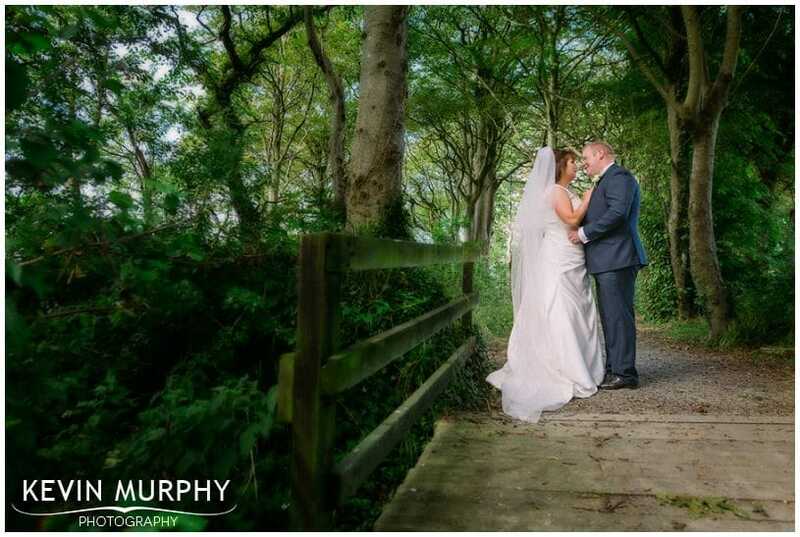 Even though they are based in the UK, Doolin is home for Laura and is a special place for both of them – in fact I got a proud, personalised tour from them when I met up with them to talk about their wedding plans! 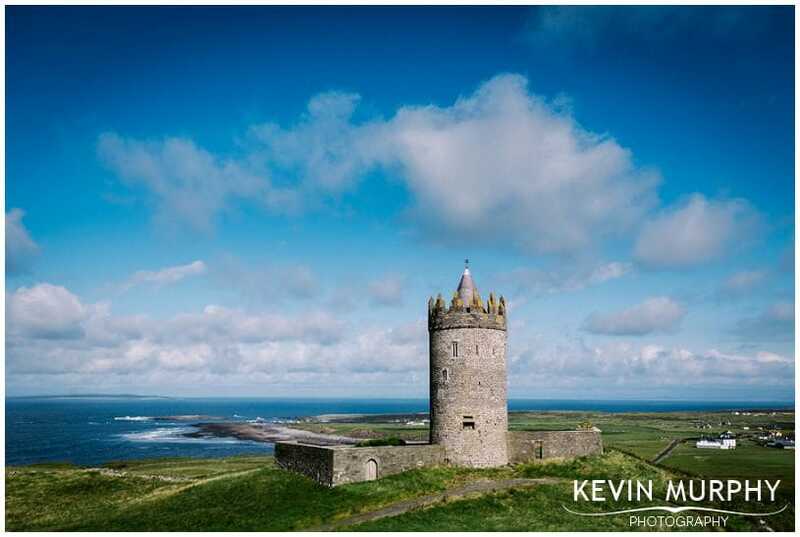 The iconic Doolin Castle is on Laura’s father’s land so it has special meaning to them which made it a great backdrop for photographs. Laura being helped into her dress by her mother and grandmother – and everyone’s reaction to seeing her in the dress for the first time. The page boys and flower girl making a swift entrance at the church by running up the aisle at full speed! The emotional handover when Henry and Laura finally saw each other. Laura and Henry’s parents lighting the individual candles. The ceremony – Canon Peter got everyone involved and made it very personal. The lengthy reciting by the groomsmen of the Austin Powers “broken leg” scene! 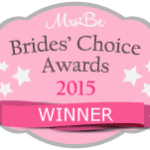 The marquee – I loved it! 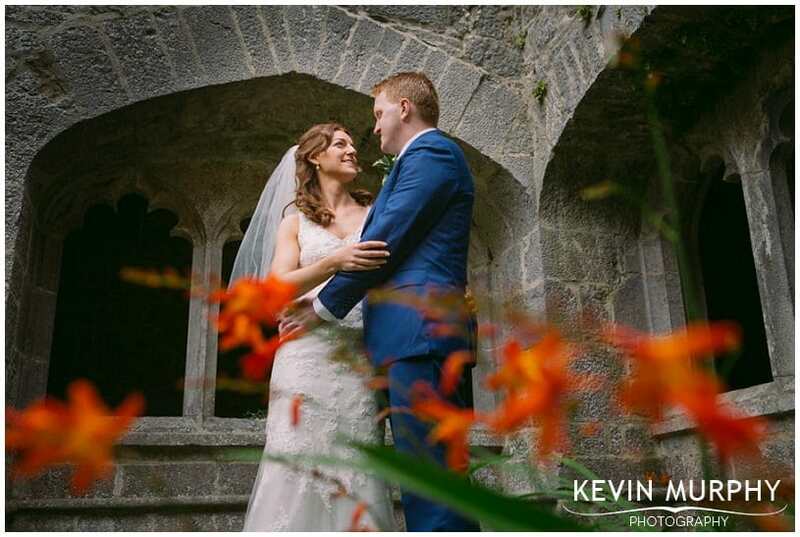 The panoramic views of Doolin, the coastline and the castle, the decor, the flowers – everything! Henry’s graphic design input – from a wedding font, to the table plan design to incorporating it into the vases on each table. Henry’s training manual – “The feckin’ book of Irish sayings for when you go on the batter with a shower of savages”. 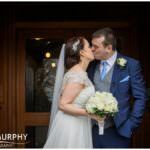 Tessa and Shugi travelled all the way from Hawaii to get married in Lisheen Castle. Tessa’s family are Murphy’s so we all got on like a house on fire (well, once they got used to me photographing all the little “real” details and stopped tidying up every time they saw me coming! 😉 ). 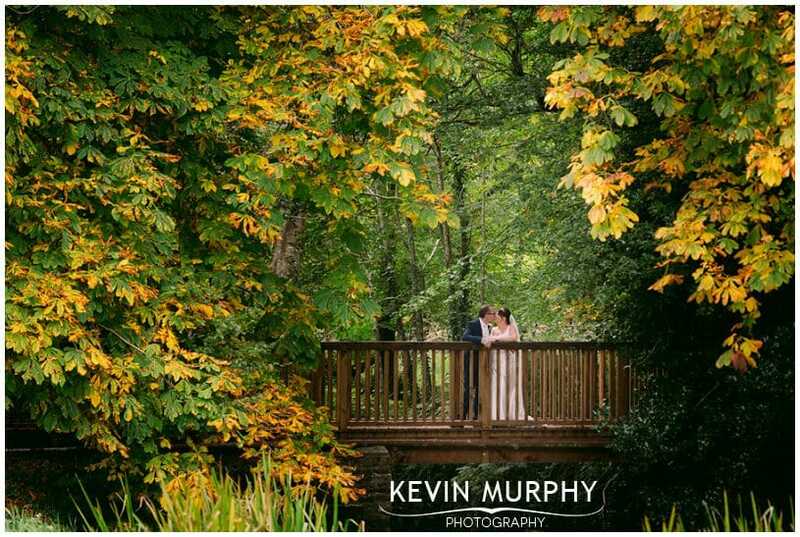 They were married in a traditional celtic ceremony on the grounds of the castle – that is until it started pouring rain! It. Was. Torrential! After persevering for about 5 minutes, it was decided we should all move inside, dry off, and finish the ceremony indoors. At least they got to experience the real Irish weather! After the ceremony, and in between showers, we took some photographs on the grounds. Shugi is the inventor of “The Shugi”, so it was an honour to see him perform this gravity defying move. 😉 It was a lot of fun and it was lovely to hang out with such a nice bunch of people for the day. The location. 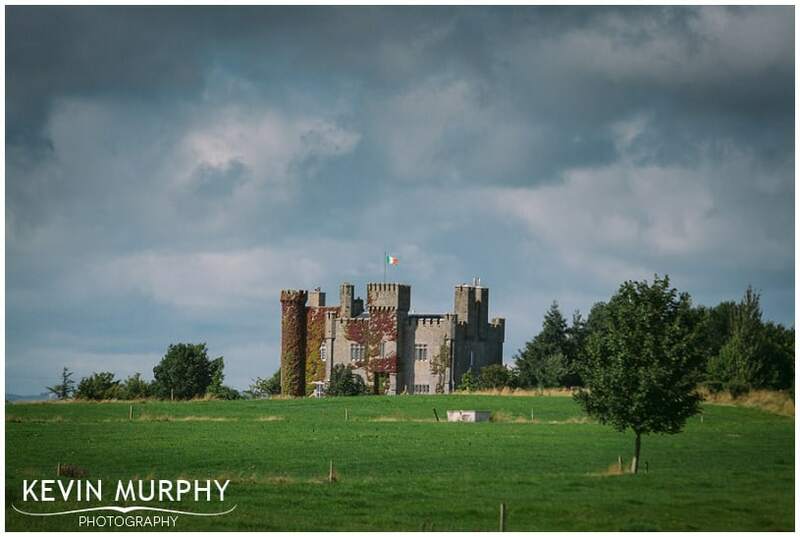 It was my first visit to Lisheen Castle and I can’t wait to get back there some time. The welcome sign that Shugi’s dad designed – including a traditional logo created just for Tessa and Shugi. Generous dashings of Rescue Remedy – it definitely did the trick, although I’m not sure if there were any nerves to begin with! Tessa’s dad emotional reaction to seeing his daughter in her wedding dress. The beautiful garden location for the ceremony. How, when it started raining, everyone put up with it and carried on despite how heavy it was! NOTHING could stop these two making their promise to each other. Having a lot of fun with the bridal party doing all sorts of crazy photographs. Tessa and Shugi being welcomed to the local pub like the pair of celebrities they were! 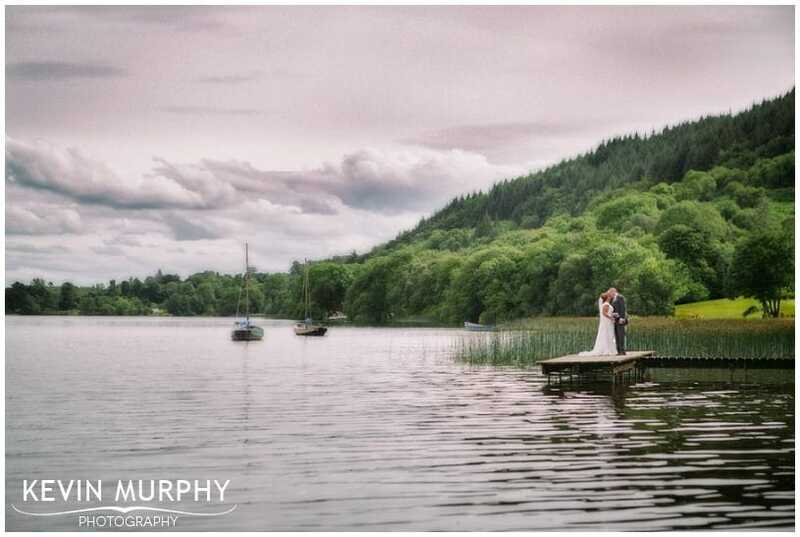 Alison and Jamie were married in the Star of the Sea church in Quilty and held their reception in The Falls Hotel in Ennistymon. 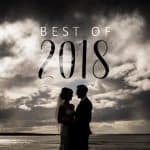 The amount of effort they had put into their wedding – from personalized drinking glasses to sweet jars, fairy light decor to refresher baskets in the bathroom. Their personalities were everywhere. Coming up with a safety word with the bridesmaids! The locket in Alison’s bouquet. The groomsmen tuning up for the bride’s arrival. The laughter. It was one of those weddings that was great fun from start to finish. It was very obvious that Jamie and Alison have a very close-knit group of great friends. 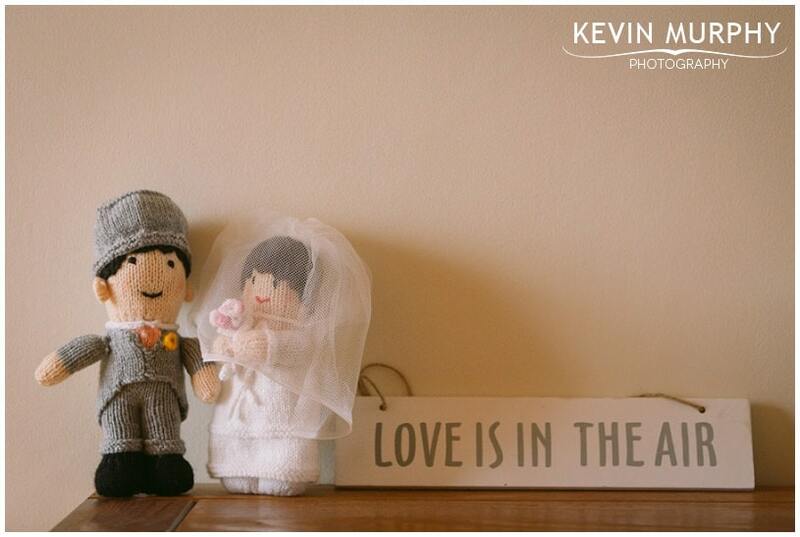 Amanda and David were married in Raheen church. 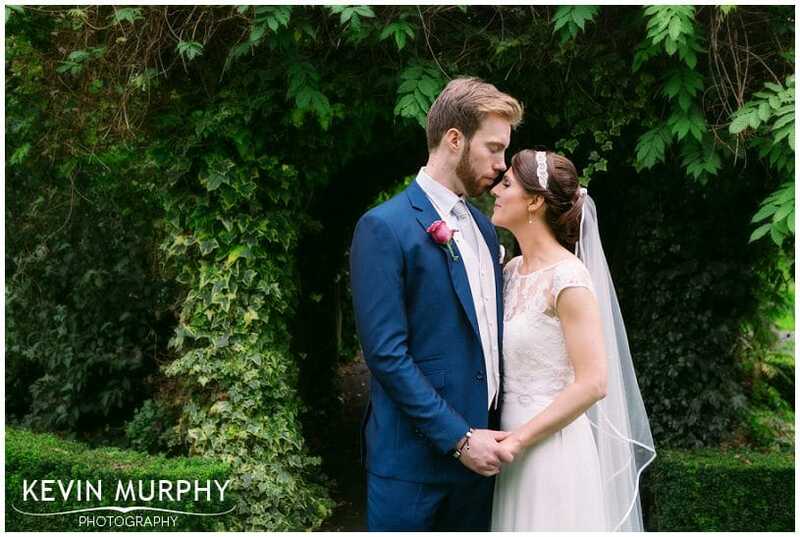 Afterwards, they made their way to the Dunraven Arms in Adare for their reception – a trip that Amanda’s parents made on their wedding day 36 years earlier. The hilarious music video the girls put together for Amanda’s hen party. Tying JP’s tie – it got there in the end. Denise and Mary lighting the candles, what a lovely touch. Climbing into the garden at the abbey – not easy at the best of times and definitely a challenge in a wedding dress and heels. Worth it though! The mariachi band at the reception – it really added to the fun of the drinks reception. The lighthouse wedding cake – a throwback to David’s proposal at Sheep’s Head. The commotion in Gina’s house that morning. And the oasis of calm that Gina’s dad found outside with the dogs! Meeting the boys in Finucane’s and getting a tour by Speedy. They were one step ahead with the tic tacs too! Using a hawk to bring up the rings. Not the bird mind you, the plastering tool, a nice nod to David’s work. Probably the three friendliest, giddiest, excited flower girls I’ve ever seen. Gina and David taking me to a “mystery location” for their photographs! It was a bit of a trek, but we did find the wooden bridge in the end! It was worth it too. Their signed jenga blocks – what a great idea. Mathew, who lived up to his description as “the John B. Keane of best man speeches”! The craic on the dance floor, helped in no small part by J90 who were in top form.